So I thought it might be pretty neat to start posting something different then crocheting things up here every now and then, thus comes ANFSCD or "And Now for Something Completely Different" Episode 1! So you may have seen these cool new art things people have been doing around the webs where they melt crayons on canvas to make it look like it's raining. 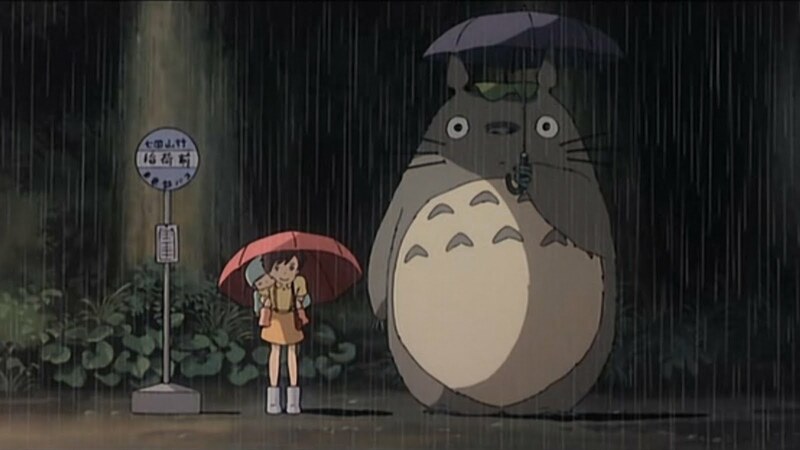 Well my girlfriend came up with a great idea where we could do the scene from My Neighbor Totoro (her favorite movie) where they're standing at the bus stop. There's one way to make these paintings in particular that I liked better then the "original" way which I found a tutorial here, but, I couldn't get my hot glue gun working, so we just resulted to making it in a whole new, more fun, and more dangeous way! Wooo!! This is our finished product. Key note: cut the stencil out of painters tape and then paint it on! I had to do it twice because I'm dumb. Also, when your painting your design on, dab the paint on gently, or it will slide under the tape and make the edges less percise and more fuzzy. After you have your design painted on, let it dry and then put tape over the design itself (I forgot to take photos, sorry :/). Also put little tabs up so the "rain" runs over the umbrella. This tutorial shows how to do this all wayyy better haha. So, like I said earlier, I couldn't get the glue gun working, so we did it the "old fashion" way. We just took a lighter and melted the crayons manually! I have to say, I think it was a lot of fun doing it this way haha. Finally peel off the tape reveling your finished product! Here's ours! I really like how it turned out, and I think it was an awesome first attempt! Look for lots more of these coming soon! !